Favorite Quote: I got myself some dice and some paper and some pencils and settled down with friends to pretend to be Thorg the Barbarian, to eat, drink, and be merry. 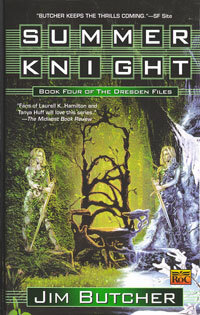 Someone killed the Summer Faerie’s Knight and the prime suspect hires Harry to prove her innocence. Unfortunately for Harry that person is the Winter Queen, Mab. She makes Harry the Winter emissary and tasks him to find out the truth. Harry moves from Faerie court to Faerie court in an attempt to find out just who really killed the Summer Knight and how he is going to survive finding out. Even worse for Harry is that Mab purchased a debt Harry owed another Faerie. He now owes Mab three favors, one of which will be discharged doing by finding who killed the Summer Knight. Harry’s first love returns. This might have been a more joyous occasion had Harry not spent his entire adult life assuming he had killed her. She is also his counterpart, having been appointed as emissary of the Summer Court. The two will continuously run into each other and Harry begins to doubt that he can trust her. This book shows a lot more of the Faerie world than previously shown. The Faerie world is divided into two courts, Summer and Winter, each with three queens. They have a complex political system that makes the U.S. Congress look healthy by comparison. Harry is dragged kicking and screaming into this world, but he goes. This book contributes to the overarching plot line as well. The White Council wants the Faeries help to secure safe passage through their world. Harry would prefer to turn down Mab’s request, but cannot because the wizards need the help of the Faeries in the war with the Red Court vampires. The ending of this book has probably the biggest battle in any Dresden Files book so far. It also shows an interesting aspect of Harry’s personality, he will always do what he thinks is right, but sometimes he really does not like the result. Even when he would do the same thing again.